Ready for the most addictive and delicious dip you’ll ever have? Honestly, nothing in the world makes me happier than chocolate and peanut butter. Well… maybe my family. But this comes in a close second. 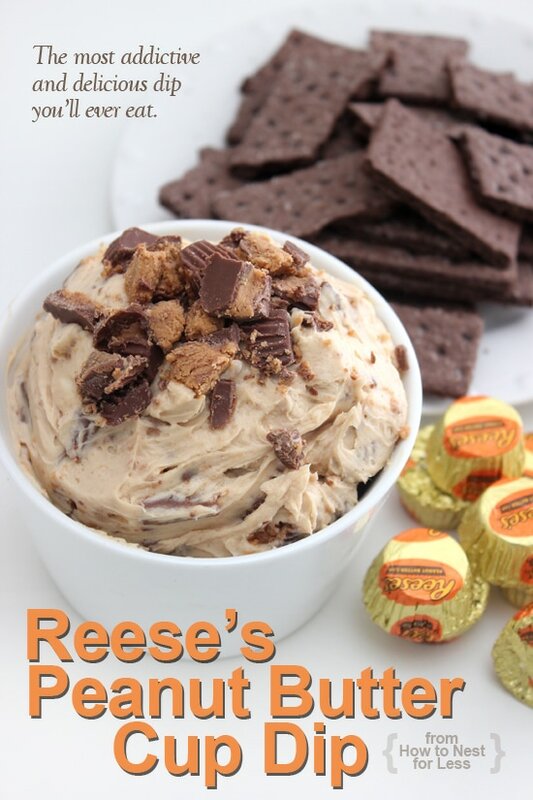 I’ve seen lots of recipes for dessert dips with chocolate chips, but thought it might be a little more tasty with Reese’s and real peanut butter mixed in. So here’s the best dessert ever… seriously. 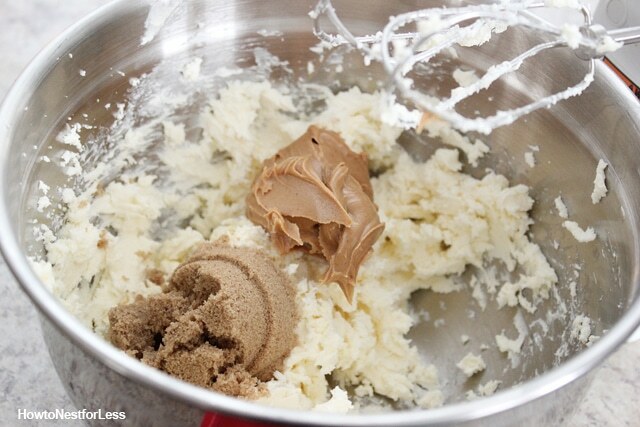 Beat together the softened butter and cream cheese until smooth. 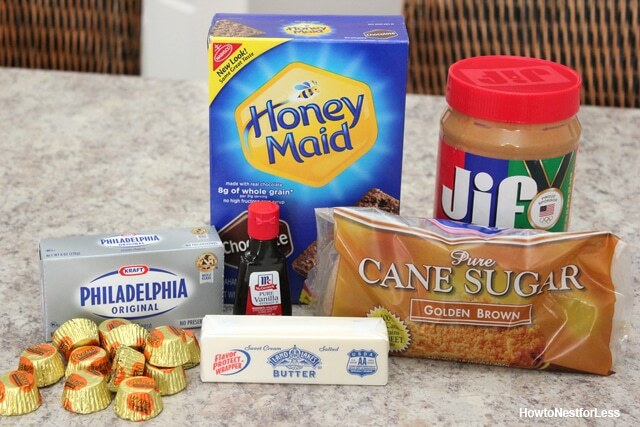 Mix in the brown sugar and peanut butter. 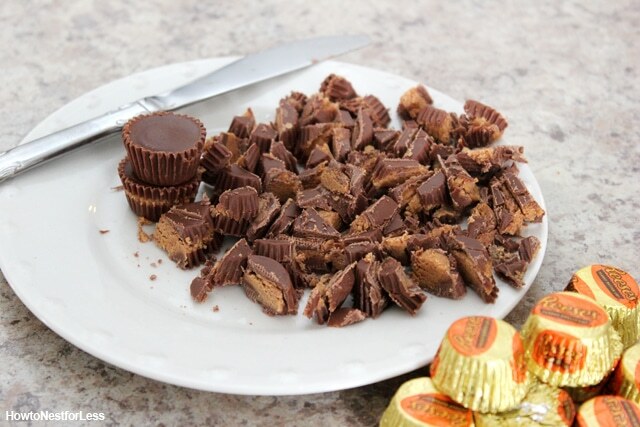 Mix in the vanilla, then use a rubber spatula to mix in the mini Reeses. I like to refrigerate overnight for the flavors to settle (gets rid of some saltiness). 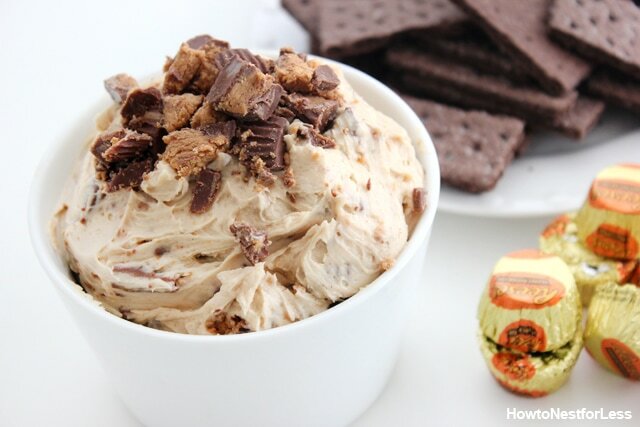 Serve chilled with chocolate graham crackers. Then dig into the bowl of goodness until you have to change into stretchy pants. Then go eat some more since it’s now officially cheat day on your diet cause you already ate half the bowl. Then come back here to tell me how good the dip was. Then yell at me for not helping you get ready for swimsuit season. It’s ok… I can handle it. I wish I had seen this earlier! My Bunco group would be all over this! Oh, I’m sure they would LOVE it! Umm… after a party with 12 people, we still had TONS of leftovers! Oh bummer! Refrigerate for 24 hours, then let it sit out for 2 hours and taste again. This happened to me once but it tasted fine after this… not quite sure why! Maybe the brand of peanut butter is too salty? I can’t use cream cheese because I have a lactose intolerant family member. Do you think I could substitute the cream cheese for marshmallow fluff? I have done this in the past with previous recipes and they have turned out fine, but I’m not sure about this one. Ooh, Im not quite sure. I’ve never tried that before. Sounds like a yummy substitution to me though! I actually ended up trying it and it turned out wonderful! I used a 10oz jar of marshmallow fluff and a dollop of whipped cream. It tasted like peanut butter pie filling. Thanks for the recipe, I will be trying the cream cheese version soon! Refrigerate it overnight and taste again the following day. Should cure some of the saltiness. I plan to use unsalted butter and low salt cream cheese. May help some with the salty taste. It sounds wonderful to me! !